This entry was posted in Window Cleaning and tagged gutter cleaning injury safety South Shore Window Cleaning on July 18, 2012 by Jesse. I stumbled across an article yesterday revealing that window cleaning was considered the most dangerous occupation in Great Britain. According to Churchill Insurance, window cleaners beat out military soldiers, fire fighters, deep sea fishers, pilots, police officers, roofers, and even circus performers in the overall danger of their jobs. Window cleaners face not only falls from scaffolding and ladders, but also slipping on wet surfaces, and repetitive motion injuries. So they have the smaller but deadlier life-threatening risks and also the common and almost unavoidable chance of being injured from rotator cuff tears, carpal tunnel and the like. The good news, for me, is that I can exert a lot more control over how safe my operation is than a window cleaner who works for a big company. As far as repetitive motion injuries go, I think I have reduced my chances for aggravating my body through the use of ergonomic tools – swivelling window scrubbers and squeegees and the use of a pole instead of bending over and/or crouching. And of course the biggie: falling from ladders. I have very conscientiously, over the years, revised and improved my use of ladders. I added leg levelers to my ladders to cope with uneven ground, I have standoffs to stabilize the top of the ladder as it is rested against different surfaces. In fact, I have the only ladder standoff/stabilizer that is OSHA approved for roof access. 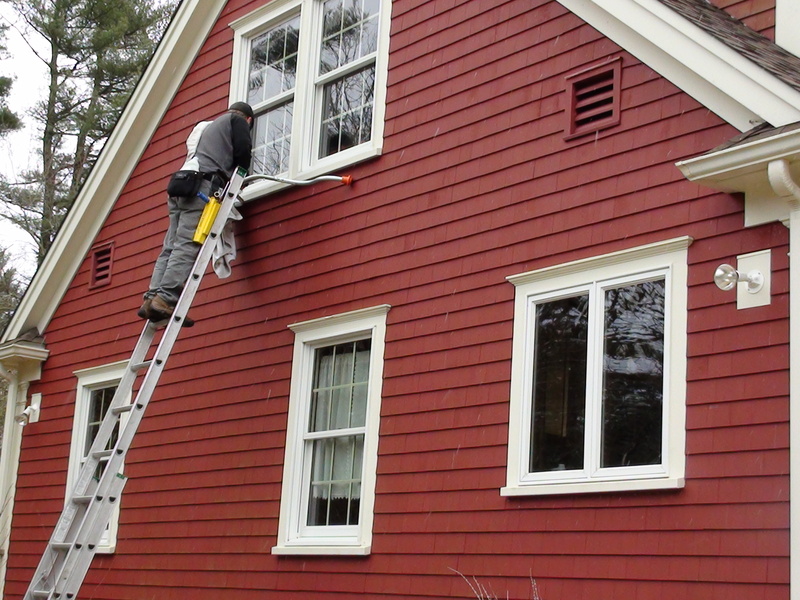 This works great for gutter cleaning – instead of leaning a big heavy ladder against your gutters and possibly denting them, my standoffs go up over the gutter and rest securely on the top of your roof. Having the experience really helps out with safety. A lot of window cleaning companies, unfortunately, employ seasonal helpers with barely any experience – often young adults in their late teens or early twenties. Although young lads are more willing to risk their safety climbing up 30 feet to clean a window, they are not as cautious or knowledgeable about how to properly ensure their safety.